With the Champions Indoor Football League meetings commencing this weekend in Dallas, Texas where representatives and coaches from all 14 teams will be present, the CIF announced today the front office staff for the 2017 season along with new changes that will be in store for the league the year. Emily Austen has more than 10 years of broadcast journalism on her resume, and has worked as a sideline reporter for the Boston Celtics and Orlando Magic of the NBA as well as with the Tampa Bay Rays of MLB. Emily is excited to bring her experience and passion to the CIF and the indoor football world. She will be the weekly host of the new "This Week in the CIF" video highlight production that will recap all of the weekends games, scores, highlights and stories within the league each week. 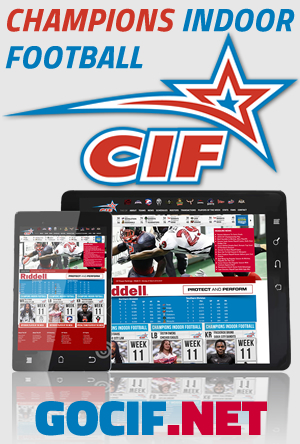 The video production is a new venture that the CIF is implementing for the 2017 season that will be made available to all fans each week, so be on the look out for Emily on the sidelines at some of your teams games this season. "Emily is a very talented and experienced broadcast personality and we are all looking forward to having her assist the league in the need to have a growing internet and social media presence" stated Bertz.